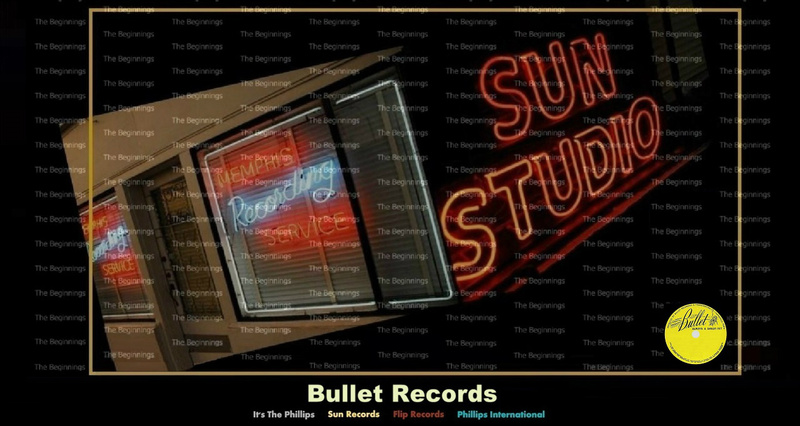 BULLET RECORDS - At least four record labels with the name Bullet Records have existed. The earliest one was a record label based in Nashville, USA, which was started in 1946 by Jim Bulleit and C.V. Hitchcock. 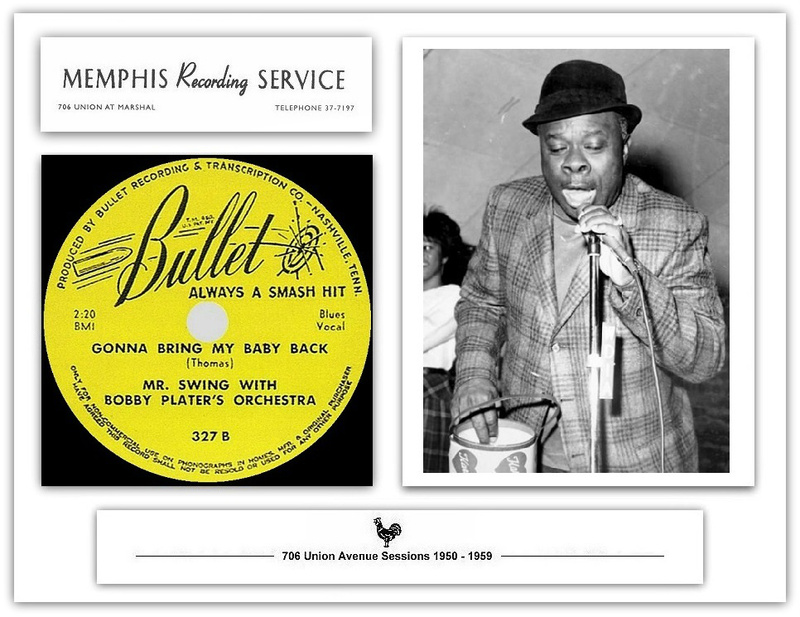 Bulleit was an early partner in Sun Records. Its only national hits were by orchestra leader Francis Craig. The pop hit "Near You" made in early 1947 was a monster, topping the charts for seventeen weeks and having a chart run of twenty-five weeks. Craig also made the charts at number 3 with "Beg Your Pardon", but no further hits were forthcoming. Despite these hits, the label was known for country music artists such as Boots Woodall's Radio Wranglers, who also recorded for Capitol Records, and Southern Gospel artists such as the Rangers Quartet and Speer Family. In 1949 they released B. B. King's first commercial single, "Miss Martha King". Too much money was spent in hope of repeating the success of Francis Craig's "Near You" and the label was in trouble by 1949. Jim Bulleit sold out to his share to Hitchcock in February of that year. The label limped on for a few years but was out of business by 1952. JIM BULLEIT - Nashville recording industry pioneer. Born November 4, 1908 in Corydon, Indiana, and got a degree in music education from Illinois Wesleyan but discovered almost immediately that he had no aptitude or interest in teaching. Music industry career active 1940s-1950s. Co-founder of Bullet Records, one of Nashville's first independent record labels and the first to achieve national status. After the usual small-market apprenticeship, he had migrated to San Francisco for CBS in 1943 and, When he found that he didn't like the West Coast, relocated to Nashville, where he took a job as an announcer with WSM home of the Grand Ole Opry. He was soon promoted to run WSN's Artist Service Bureau, the Opry's booking agency, which he turned into a financial windfall, both for himself and for the Opry. Bulleit also met Francis Craig, a member of the family that owned National Life, owner of WSM (We Shield Millions) and the Grand Ole Opry. Jim Bulleit, who had recently left the station under somewhat clouded circumstances, to start the record label Bullet formed with local jukebox operators Eugene Cashion and C.V. Hitchcock. Bulleit was reluctant initially. In less than a full year of operations his biggest hits come in the rhythm and blues field. Within eighteen months Bulleit had been forced out of the company and, in his ever-resourceful but not always provident way, had embarked on a headlong hegira of sales and promotion that saw him starting up a number of record companies and song publishers without notable success, supervising national radio promotion for Hadacol patent medicine signing and almost immediately losing the song publishing of country music's latest superstar Lefty Frizzell, and running the Louisiana Hayride booking agency in Shreveport for much of 1951. Jim Bulleit returned to Nashville in January of 1952, briefly entered the insurance and securities business, and launched his new label, J-B Records. In October 1952 he started up an rhythm and blues division. So long as it was understood that Bulleit would continue with his own label, J.B. Records, and his own little distribution business. As the years passed, large record companies like RCA, Decca, and partnership in Sam Phillips' Sun Records in 1952, swallowed the smaller labels or drove them out of business. Bulleit tried several times to revive his record label, but the specter of bankruptcy ultimately forced him out of the music business. He promoted one “big idea” after another for the next few decades, from cemetery developments to selling candy, bringing fresh enthusiasm and optimism to each new project. He died on December 12, 1988, but his legacy is still evident in Nashville today, where the economic impact of the music industry was estimated to be $6.38 billion in 2006, with 9,437 jobs directly related to music production. ''Beer Bottle Boogie" has a strong boogie piano opening from Milt Buckner, whose trademark grunting can be clearly heard on these recordings. Rufus tells how he got higher than a kite, then all hipped-up, then burned at poker - the recipe for getting the beer bottle boogie way down deep inside. Then the classy band really comes into its own with a fabulous sax solo while the other players interject and squirt all around it. Rufus to Martin Hawkins, "I do remember that 'Beer Bottle' song, and that is a good band, a quality band there. I think so".